Back in the Autumn an offer on Facebook caught my eye for a super cheap short winter break to Stockholm. I’d been considering booking a surprise trip for over Josh’s birthday anyway and this seemed perfect. The flights were at reasonable times, the hotel looked nice and had good reviews and January is apparently a great time to visit Sweden. I managed to book it, arrange childcare and book Josh the time off work without letting slip to him. I finally told him on Christmas Day and he was very impressed and super excited. We flew out just over two weeks later! We stayed at a cheap hotel near the airport the night before as we had an early flight on the Friday. This worked well as it meant we were in the city centre by lunchtime. My lovely friend Dani (follow her here) who used to live in Sweden gave me lots of tips. She suggested things to do and see and just gave me some really helpful advice on visiting Sweden. We got the Flygbussarna from Skavsta aiport into Stockholm city centre. We downloaded the app and bought our tickets beforehand. It was all super easy and stress free. Once we arrived in Stockholm we just started walking and soon found ourselves on one of the main shopping streets. Sadly we only had hand luggage so couldn’t take advantage of the shopping but it had loads of great shops including the most amazing H&M’s! After a mooch in the shops we put our hotel into google maps and started walking in the right direction and decided we’d just stop somewhere on route for some lunch. Stockholm is made up of fourteen islands and they are all joined by various bridges. It is a much bigger city that I originally thought, we did A LOT of walking. We walked across to Gamla Stan which is the old town area and very pretty with lots of cobbled streets and traditional Swedish architecture. Next it was across to Sodermalm which is a really trendy area where we found some of our favourite spots! We stopped here in an Espresso House for some lunch and I am so glad we did as we ended up coming here most days. Its a really cool coffee shop chain with awesome interiors. They were everywhere in Stockholm. They serve delicious food and coffee but the hot chocolates are also insanely good. It basically comes with a chunk of chocolate on a stick that you stir in until it melts. Officially the best hot chocolates ever. We stayed at Motel L which was just across the water from Sodermalm. The hotel was super modern and again, had great interiors. The room wasn’t huge but it was perfect for what we needed. I booked the whole break through Expedia and it was such good value for money. On Saturday we enjoyed an amazing lay in before wrapping up and heading out into the cold. First up we did a really lovely free walking tour around Gamla Stan. Our tour guide was great and we learnt loads about both the Swedish culture and history. We then visited Fotografiska which is a huge photograhy musuem. It was really interesting although it didn’t take us very long to get round it. When we came out it was dark so we made our way to Meatballs for the people for an early dinner. I’d read online that this was THE place to go for traditional Swedish meatballs. And my goodness, it did not disappoint. 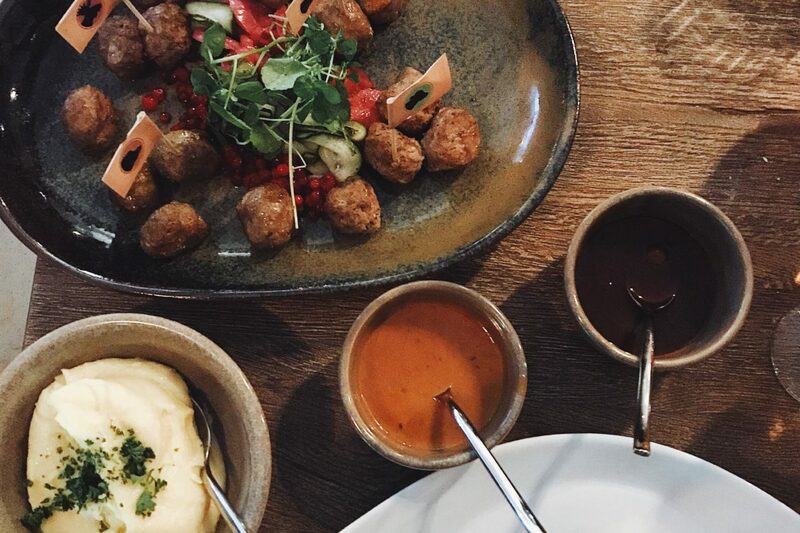 We chose a sharing platter which had a few different varieties of meatballs. Every single mouthful was bloody amazing and we both really enjoyed it. I can totally see why it’s so highly rated. After dinner we headed back to our hotel, stopping for pick a mix on route as it is a Swedish tradition they enjoy every Saturday called ‘Lördagsgodis’. So of course we had to get involved!! On our last morning we got an Uber back into the city centre so we could mooch about for our last few hours. We checked out Östermalms saluhall which is a huge market hall. We then enjoyed one last Espresso House hot chocolate. And we also managed to grab a last minute cinnamon bun (a must when in Sweden!) before we had to make our way back to the airport. Overall we both really enjoyed Stockholm. The Swedes are all super friendly and I love the slower pace of life they seem to have. All the incredible interiors left me feeling very inspired as I have always been a big fan of the Scandi homeware styles. I would definitely love to return to Sweden again one day with the children. Perhaps in the Summer to explore more of the countryside as I have heard it is super beautiful! I loved our little child free Swedish break and it was so nice to just be us for a few days. We didn’t have to worry about our babies as we knew were in safe hands with their Grandparents back home. I’m a big believer that all parents need time out sometimes. It’s something we try to do a few times a year. Even just one night away, it always leaves me feeling totally recharged. I truly believe that time away from the children makes me a better parent! The quality of these photos is pretty rubbish as they are just iPhone snaps, I took my camera with me but I just didn’t get around to using it. But I love these photos all the same!